The Bute House Guesthouse is an Elegant, Victorian, Bed & Breakfast located in the beautiful Scottish coastal town of Rothesay. We have always been a high quality establishment, providing our customers with beautiful rooms, great food and a high level of customer care. Josie & Leo have been the owners of this successful Bed and Breakfast since 2005, and have over eight years experience in the Bed and Breakfast Industry. Recently we have refurbished the guesthouse. And although we have added many modern features to the building, we have strived to keep its Victorian appearance. 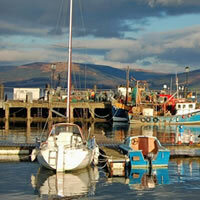 Looking for Local Accommodation in Rothesay? Then make sure you check us out, we offer first class accommodation to our customers at competitive rates. Contact us today and we will be more than happy to answer any questions or queries that you may have.